An old tradition is coming back to life thanks to a local distillery and a Navy warship. Tobacco Barn Distillery of Southern Maryland and the Historic Ships in Baltimore have teamed up to create a Maryland-made rum, complete with molasses from Baltimore's Domino Sugar. 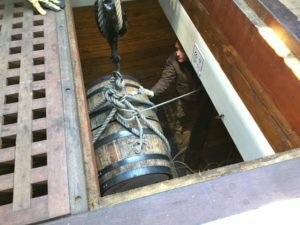 The two 53-gallon rum barrels – weighing approximately 500 pounds each – were hoisted aboard the USS Constellation earlier this month with help from the partnering organizations. The barrels are currently stored in the lower level of the ship, where they will age for the next four months. It's been more than 150 years since the USS Constellation sailed with barrels of rum resting on the backbone of the ship. Back in the 1800's, rum was routine for sailorsa tradition that the Navy abolished in 1862. "The rumwas part of the daily ration for sailors originally on the Constellation back in 1854 when she was commissioned," said Scott Sanders, a retired rear admiral and partner of Tobacco Farm Distillery. The rum is resting in old bourbon barrels aboard the floating Constellationa completely new way of manufacturing the beverage. The ship's movement will help age the rum and provide more direct contact with the barrel, giving it a unique taste. "The product will come out a lot differently than it would just sitting in a cellar," said Chris Rowsom, executive director for Historic Ships in Baltimore. The combination of Maryland-made ingredients and the exclusive aging process makes this rum one-of-a-kind. Hear more from Rowsom and Sanders in the video below. A rum barrel gets lowered into the ship. This partnership is the latest development in Maryland's revived industry. In February, Dragon Distillery opened its doors as the first of four distilleries in Frederick. Over the summer, Governor Larry Hogan visited Seacrets to cut the ribbon at its new Ocean City facility. And Sagamore Spirit, born from Under Armour CEO Kevin Plank, is slated to open in Baltimore any day now. This April, the American Distilling Institute will host its Annual Craft Spirits Conference in Baltimore, proving that distilling in Maryland is making a comeback. 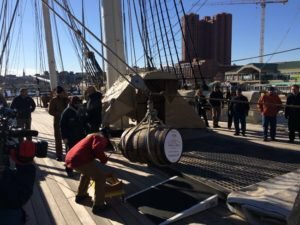 The USS Constellation Rum is expected to be bottled in the spring to coincide with the expo, and a portion of the proceeds will go towards the Historic Ships in Baltimore. If all goes according to plan, this Maryland-made product might just become an annual tradition. View the rum barrels during a public tour aboard the USS Constellation. Learn more on historicships.org. Interested in learning more about distilling in Maryland? Visit the Maryland Distillers Guild at marylandspirits.org.